I had chicken breasts, sweet potatoes and asparagus in mind for dinner, then thought, "Who wants a plain chicken breast?" 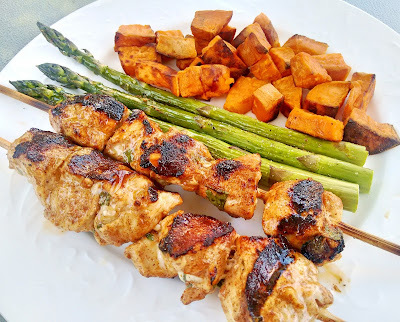 I made this Moroccan style marinade for kebabs instead! Don't forget to soak wooden skewers for 1 hour in water prior to grilling, otherwise they will burn. You can soak extra skewers and place them in the freezer for easy preparation next time you want to use them. Slice chicken breasts into 3 cm (1.5 inch) pieces. Place inside a freezer bag or Tupperware container. Mix remaining ingredients together and whisk. Pour over chicken pieces and toss to coat. Refrigerate for 3 to 4 hours. Remove skewers from water, then feed marinated chicken pieces into skewers. Grill until juices run clear and chicken is fully cooked.